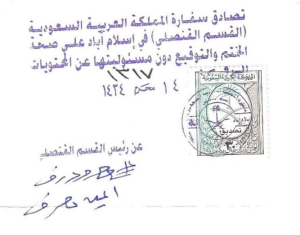 An example of a Saudi Embassy Attestation and Authentication. What is an embassy authentication? South African documents presented for use abroad in a country that does not form part of the Hague Convention have to be legalised in terms of an embassy authentication and legalisation process. After your document has been authorised by the High Court, it will be forwarded to the Department of International Relations and Cooperation (DIRCO) before being sent to the destination country’s embassy for further authentication. Because all embassies have different procedures regarding authentications, it can be a complex process. When you legalise a document, it means it is signed, sealed, and affixed either with an Apostille Certificate (where the destination country is a member of the Hague Convention) or with a Certificate of Authentication (where the destination country is not a member of the Hague Convention. Only documents that are drawn up or executed within South Africa can be legalised by apostille or authenticated in South Africa. When a country is not a signatory of The Hague Convention, the same process that gets followed with an Apostille must still be followed. Documents are weighed against pre-determined criteria, and if those criteria are met, the document will be legalised with a Certificate of Authentication. Which South African Documents require Embassy Authentication? Which documents usually cannot be legalised by Embassy Authentication? •	Any copy certified by any commissioner of oaths including abridged certificates of marriage, birth, death, or police clearance certificates, certified copies of letters of no impediment (marital status) or proof of citizenship, certified copies of travel documents or identity documents, and documents legalised by a Commissioner of Oaths to be true copies of the original, as these documents must follow the route of the Notary Public / Registrar of the High Court. As the final step of getting your documents legalised for use outside of South Africa, you will have to get it authenticated at the embassy of the country in which it will be used. Some countries refer to this process as Apostille while others call it Attestation. Most embassies charge a fee for this service and might also have a few additional requirements and processing times, depending on the country. Countries that require this often for South Africans are: China, Thailand, Vietnam, UAE/Dubai, Taiwan, Qatar and Saudi Arabia. See our post on Attestation here. As you can see, embassy authentication is yet another step of the process that you will need to follow in order to get your documents legalised for use outside of South Africa if the country you intend on using the documents in does not form part of the Hague Convention. apostil.co.za can assist you to acquire any of the above documents and authentications, attestations, etc., quickly. See our pricing.